Exclusive White Marble Elephant Figurine is fully handmade inlaid with the different types of semiprecious stones. 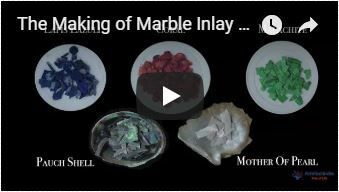 The semiprecious stone inlaid into White Marble Elephant Figurine are Paua Shell, Turquoise, Lapis Lazuli, Malachite, Garnet, Mother of Pearl and Carnelian. This beautiful piece is manufactured by skill artisans in the same style and technique as The Magnificent Taj Mahal. The white marble is from makrana it is the same place where we got the marble for the Tajmahal in Agra India. No artificial colors or stones used and in this art piece many hard & colorful semiprecious stones are used. It is very hard to work on curve surface. The size of White Marble Elephant Figurine is 8cm height.